This is one of the proudest posts you’ll read this year! 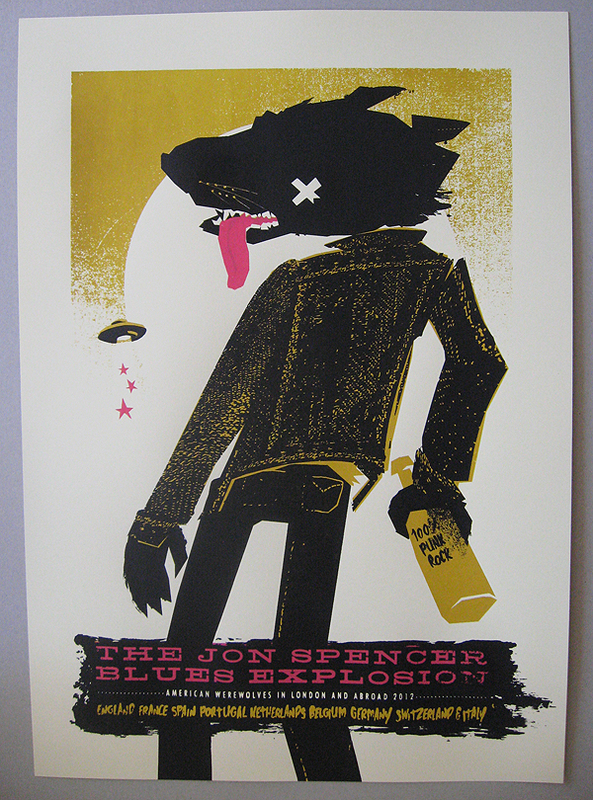 Petting Zoo Prints & Collectables vs The Jon Spencer Blues Explosion in glorious triple colour! Without doubt it has been the Zookeeper’s greatest poster ambition to work with this band, one of his alltime faves! Its also worth noting that this is the first Petting Zoo poster to make it to ATP music festival… Not just that but it seems from the reviews we read posted on the Pop Catastrophe site that The Blues Explosion devestated the crowds at that event – wicked! Time to quit yapping though and just thank the guys at Bonzo Studio who let me print and paper every inch of all available surfaces in their space to get these dry in time… the quality of stencil was great! nicely timed exposures Karl. This entry was posted in Festivals, Gigposters, Screenprints and tagged affordable art, ATP, ATP Minehead, blues, gig, gigposters, jsbx, jsbx screenprint, petting zoo, poster, rock n roll, serigraphy, the jon spencer blues explosion, tour poster, ufo, ufo print, werewolf print. Bookmark the permalink. Hey guys, any of these left? Hola chico, thanks for getting in touch! …these sold out we’re proud to say! Gracias – and how much for one of them? AHA! finally found out the name of an artist who deserves a credit on this – Sam Weber (check him out – he’s bigtime) …thanks to the phenomena of pinterest the identity of the creator of a little red riding hood illustration has been unveiled – a little anonymous jpg had been downloaded sometime and sat in the Zookeeper’s inspiration folder with a load of other miscellaneous pics, tags, throw-ups and zoological reference shots – the wolf’s muzzle and mouth is undoubtedly the shape we used here in our poster… definitely not a rip, but to use the word again “undoubtedly” worthy of comment and credit – Mr Weber, our hats are doffed – skills!